Browse our Nicky Hayden Moto GP memorabilia – autographs & signatures from the great man on a variety of items. Most with signing proof. All with a Certificate of Authenticity, fast international shipping and free UK delivery! 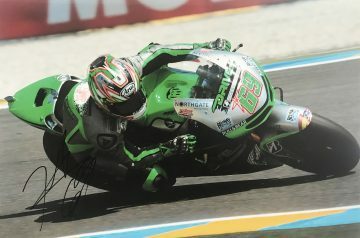 Nick or ‘Nicky’ Hayden (known fondly by fans as ‘The Kentucky Kid’) was one of Moto GP’s most successful and promising riders – a man who continues to be sorely missed on the circuit. He began road racing with the CMRA in his hometown of Kentucky – often competing against riders much older than him. He often started races right at the back of the grid as his feet didn’t yet touch the ground – so a family member would hold the bike upright for him. By 1999 Hayden had won the AMA Supersport championship – two years later as a professional AMA Superbike racer he narrowly missed victory. In 2002 he won the Daytona 200 – making him the youngest ever AMA Superbike Champion. Despite his young age he was declared AMA’s Athlete of the Year and handed Rookie of the Year honours. Hayden joined Moto GP in 2003 – and was tapped to join Repsol Honda almost immediately after his AMA triumph. He remained with Honda for ten years, finishing third in Moto GP during his first season and making steady progress towards the top spot. Hayden and Honda parted ways in 2009, when he moved to Ducati. He returned to Honda in 2014 before moving from Moto GP to the World Superbike Championship for its 2016 season. In that first year, he won his first World Superbike Champion race – securing Honda’s first seat win of the season. Nick’s promising career on the World Superbike scene was cut tragically short in May 2017, when he was killed whilst riding his bicycle in Italy. Posthumously he was awarded his very own ‘Hayden Hill’ at the Red Bull Grand Prix Circuit and inducted into the AMA Motorcycle Hall of Fame in 2018. 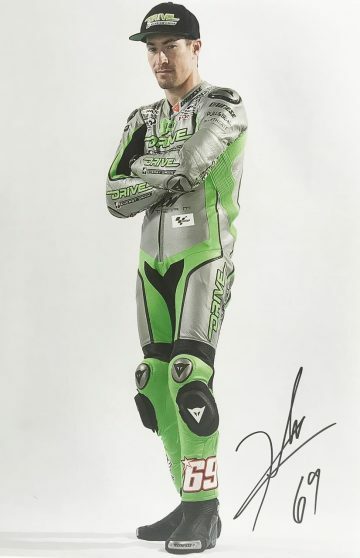 Signed Nick Hayden Moto GP photographs are understandably in high demand. We have sourced a fine selection of items autographed by the Moto GP legend – browse and buy today.